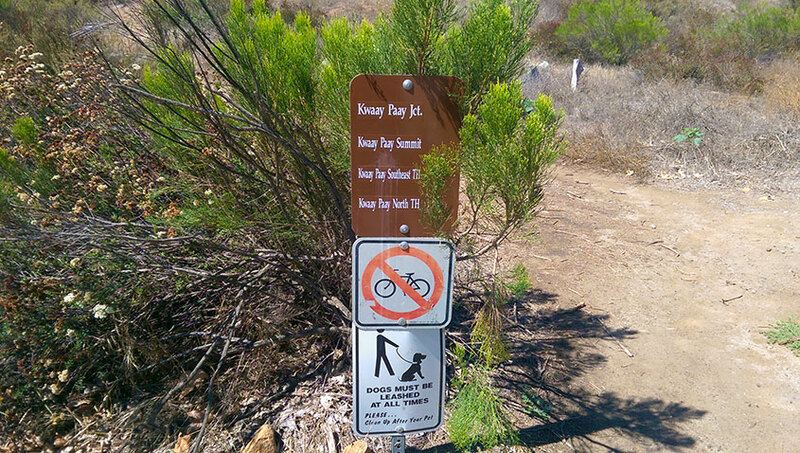 Kwaay Paay Peak Trail is a fun hike that offers a quick ascent up a challenging trail that wanders through a forest of manzanita trees. Get out the good hiking shoes and be ready for workout that will keep your legs and lungs burning all the way to the top. And remember while you’re struggling along that it’s a short hike so you won’t be so exhausted when you reach the summit of Kwaay Paay Peak that you can’t enjoy the view. 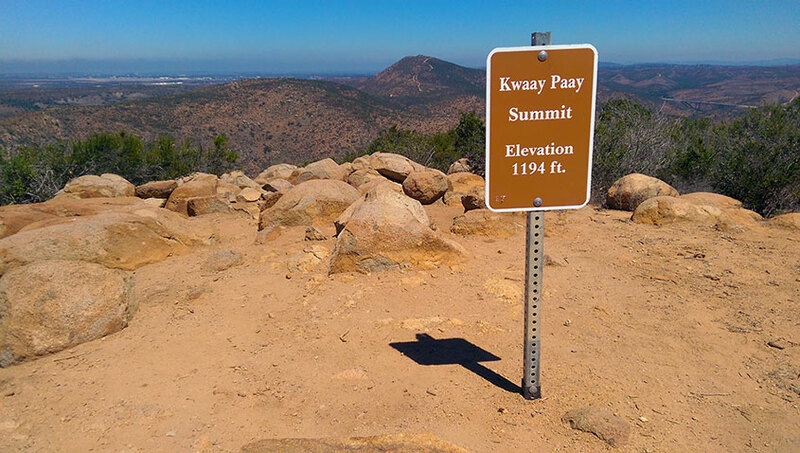 The trail at the base of Kwaay Paay Peak is open and spacious and offers a clear view to the summit. Soon after setting out, the rugged trail quickly becomes surrounded by heavy Southern California chaparral and forests of manzanita trees. The gradual switchbacks near the start soon give way to a steep, tricky trail covered with loose rocks, ruts and boulders. 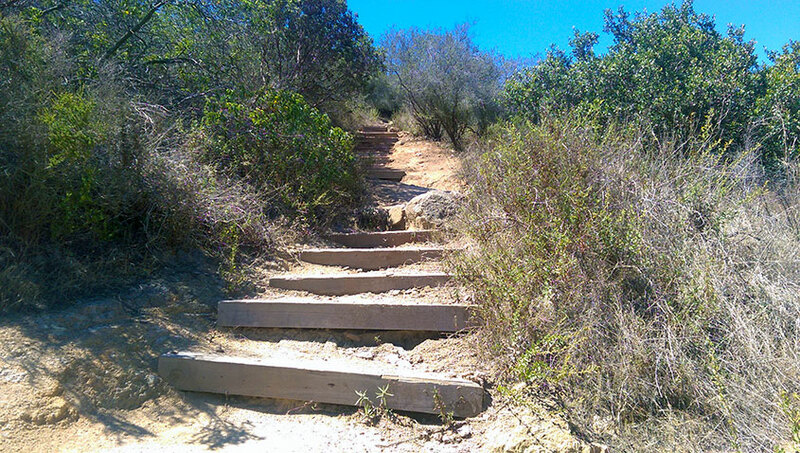 But don’t fret, there are a few stairs scattered about here and there to help hikers navigate their way up the mountain. Before you know it, you’ve reached the summit of Kwaay Paay Peak. Sit down for a snack or to catch your breath while you enjoy the view from the top. Kwaay Paay Peak was a short, fun and challenging hike that kept my lungs working and my legs burning, but it was a little too short for my tastes. I really enjoyed hiking through the manzanita forest and the dense chaparral and shrubs that surrounded the trail. 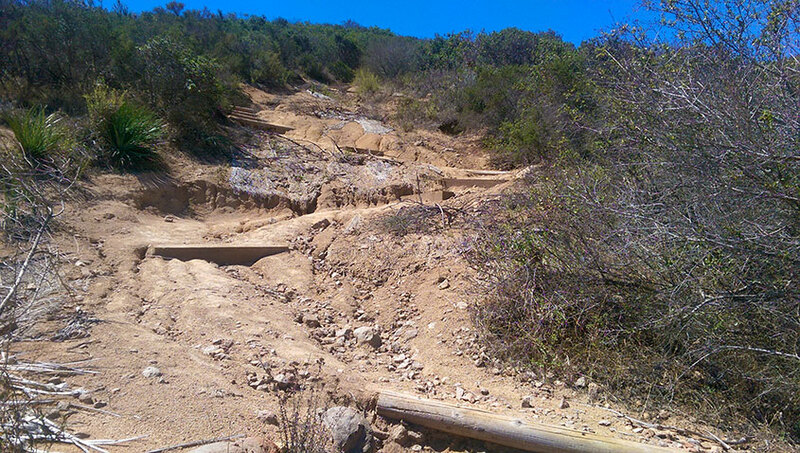 The stairs were a nice touch and I was thankful to have them as the steep grade makes navigating the loose rocks and gravel a bit difficult in places. The stairs are a nice touch! I was disappointed by the summit experience, however. Not to knock the park’s efforts to protect the environment, but the view was partially obstructed by a bright orange, construction type fence that ran the perimeter of the peak. I’m pretty certain the barrier is there to keep adventurous hikers from finding their own way down the southwest face of the mountain, where there is no official trail. Speaking of which, the lack of a thru trail is another reason I wasn’t thrilled with this hike. The addition of a thru trail that leads to the Climber’s Loop Trail, or thereabouts, would be a great improvement, and would make this hike both pleasurable and fulfilling. I hiked this trail back in January. It was the last peak of the three I hiked that day; South and North Fortuna were first. By the time I got to Kwaay Paay,I was very tired and did not enjoyed the scenery, I just wanted to finish so I can go home and rest. However, I remember it was a beautiful trail and decided that I would like to go back. I hiked the trail again this morning and this time I really enjoyed it. It was short but challenging. I loved the aboundance of wild flowers and the presence of so many birds; especially humming birds which are my favorite! 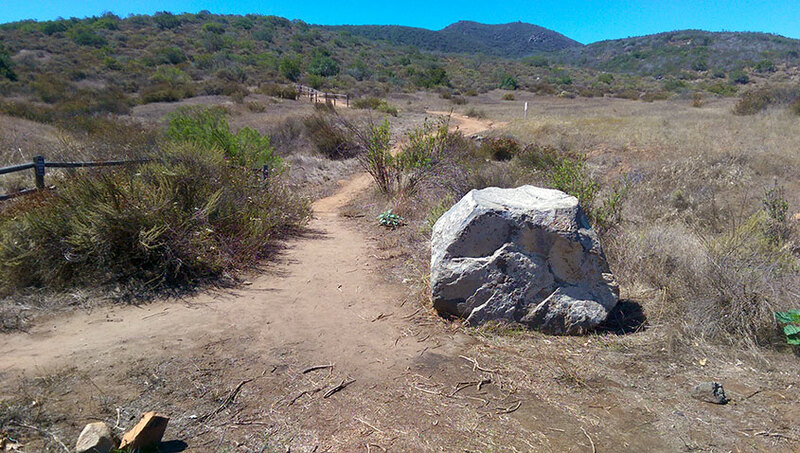 Yes it’s short but, if you do not have a lot of time and just want a quick workout, this trail is perfect for that. By the way, I love your blog and your trail reports! Thank you for sharing all this info with us, I’m really learning a lot here. Wow… three peaks in a day is no small feat! I’m glad you were able to revisit Kwaay Paay. It really is a beautiful hike and well worth the time and effort. Thanks for reading, Prieta. I really appreciate the feedback, and always love to hear when someone finds the information useful!